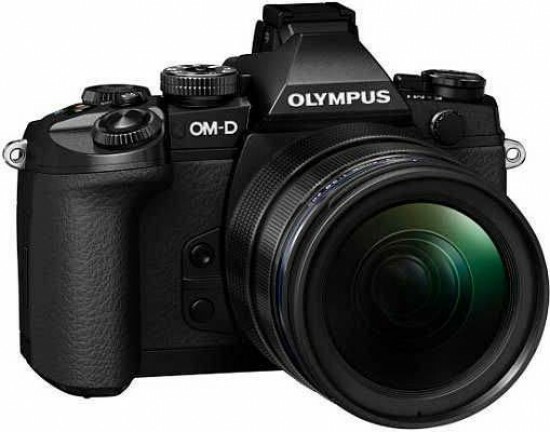 The Olympus OM-D E-M1 is the second model in Olympus's OM-D series of compact system cameras. Designed as a fully-fledged professional photographic tool, the E-M1 boasts a tough dust-, drip- and freeze-proof magnesium alloy body and a vast array of features. Inside the camera is a 16-megapixel Four Thirds imager with on-sensor phase-detection auto focus, Supersonic Wave Filter anti-dust technology, a 5-axis sensor-shift image stabiliser and a TruePic VII processing unit. Featuring a Micro Four Thirds lens mount, the camera also sports a flash sync terminal, a hotshoe, an accessory port, a high-resolution electronic viewfinder and a tilting LCD screen. New features include a hybrid AF system, a focus peaking function, an innovative Colour Creator, a customisable self-timer, 10fps continuous shooting, Wi-Fi connectivity and in-camera HDR exposure blending. The Olympus OM-D E-M1 is currently available for £1299 / $1399 body-only in the UK and US, respectively. 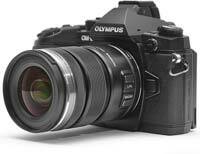 Announced in September 2013, the Olympus OM-D E-M1 is Olympus’s new flagship Micro Four Thirds camera. Building on the success of the Olympus OM-D E-M5 – which was one of 2012's most talked-about cameras, and for good reason –; the new E-M1 is a somewhat bigger and about 70g heavier model aimed at the professional/semi-professional market. While a lot of users were happy with the E-M5 providing a more than comprehensive feature set in a truly compact package, others complained about its tiny buttons and cramped control layout. The OM-D E-M1 addresses these issues by providing more real estate, bigger controls and a redesigned user interface. The most easily noticeable difference is the much more prominent hand-grip. Where the OM-D E-M5 made do with barely more than a raised ridge on its front panel, the E-M1 sports a real grip that looks positively chunky in comparison. This has enabled the designers to relocate the shutter release, which was rather awkwardly placed on the E-M5, to a position where it falls a lot more naturally under your right index finger. The new grip means that the front plate of the E-M1 looks markedly different to that of the E-M5; an impression that’s further amplified by the use of a different texture and the presence of two new buttons next to the lens mount. By default these controls are assigned to one-touch white balance and depth-of-field preview but, like almost everything else on the OM-D E-M1, they can be reprogrammed to perform different tasks if you so desire. The top deck of the camera has undergone a complete overhaul. To the left of the viewfinder housing (when viewed from above and behind) we find a new cluster of controls comprising two raised buttons and a power switch. Each of the two new buttons provides access to two sets of settings. Press the first one and you can adjust the camera’s drive modes and new HDR settings with the rear and front control dials, respectively. Hit the second and you can cycle through the various focus and metering modes offered by the camera. The placement of the on/off switch might well raise a few eyebrows as it means you will almost always need to use your left hand to turn on the camera, which is hardly an ideal solution. Actually, this is a design nod to the Olympus OM-1 film camera that had its power switch in virtually the same location – which is all nice and well, but we’d still prefer it to be in a position where you can easily reach it with your right thumb or forefinger. Moving over to the other side of the viewfinder hump, we find a traditional mode dial with a not-so-traditional locking pin in the middle. On most other cameras that have a lockable dial, you need to hold down the centred button while turning the dial – on the Olympus OM-D E-M1, the mode dial locks with one press of the locking pin and unlocks with a second press, which is a clever idea. The dial itself offers the usual P, A, S and M modes, plus a dedicated Movie mode and separate positions for Scene modes, Art Filters, intelligent Auto and Photo Story. At first, it may seem like there are no direct-access points to retrieve custom settings banks – or “Mysets” in Olympus speak –, but actually you can assign any of the mode dial slots to a Myset group of shooting settings. This means that if you only use the PASM and Movie modes and cannot see yourself using iAuto, Photo Story, Scene modes or Art Filters, you can have up to four Mysets and access them all directly from the mode dial – which is nice. The Olympus OM-D E-M1 inherits the 2x2 Dual Control system of the Pen E-P5. This comprises two top-mounted control wheels and a function lever that’s pretty easy to reach with your right thumb. (We would much prefer if the position of this lever and that of the power switch were swapped, but there you go.) The function lever has two settings. In the first position, moving the control dial on the front of the camera adjusts the aperture while the dial on the back adjusts the shutter speed. On the second setting, the dials change the ISO value and white balance respectively. You can also configure the switch’s operation too – for example, you can turn it into a handy AF/MF toggle if that makes more sense to you. The remaining controls on the camera’s top plate include the already mentioned shutter release, plus a dedicated Movie Record button and a customisable function button. These last two controls were present on the E-M5 too, but they have both grown in size. The rear plate features more or less the same controls as on the E-M5, but they have been redesigned, rearranged and joined by two new buttons. As with the earlier OM-D model, the camera's back is dominated by a large, articulated rear screen. Unlike the E-M5, this is not an OLED panel but an LCD – with a considerably higher resolution (1,037,000 vs. 610,000 dots) and capacitive touchscreen technology. Alas, the degree of articulation has remained the same – it tilts 80° upwards and 50° downwards –, which is somewhat disappointing for those who have been hoping for a fully articulated vari-angle display similar to the one found on the Olympus E-5 DSLR. The Info, Menu, Playback and Delete buttons have all been carried over from the OM-D E-M5, but all of them have become bigger – in the case of the Playback button, much bigger – and have been completely rearranged. The engineers have redesigned the navigation pad too, making it easier to use. The Fn1 button has moved to the upper right part of the rear plate, where it's easier to locate and operate with your right thumb. There are two new controls, an AEL/AFL button encircled by the afore-mentioned function lever, and a Display button located to the left of the viewfinder. The Olympus E-M5 had a pretty decent finder – with a resolution of 1.44 million dots, 1.15x magnification and an 18mm eyepoint –, but the EVF on the OM-D E-M1 is all-around better, offering a 2.4-million-dot resolution, 1.48x magnification and a 21mm eyepoint. All these specifications translate into a much improved viewing and framing experience that rivals – and in some respects outclasses – the best optical viewfinders found on any cropped-frame DSLR. This new EVF is based on the VF-4 external viewfinder, which was introduced alongside the Olympus Pen E-P5 compact system camera earlier this year, but apart from being permanently built in, it also benefits from the addition of Adaptive Brightness Control, which contributes to an improved viewing experience. As befits a camera of this class, the finder has an eye proximity sensor that allows the camera to switch from the LCD screen to the EVF automatically when you lift it up to your eye. Like the E-M5, the E-M1's electronic viewfinder “gains up” in low light, making it arguably more usable than an optical finder. Similarly to the E-M5, the Olympus OM-D E-M1 makes do without a pop-up flash but comes bundled with a tiny FL-LM2 flash unit, which clips into the external flash hotshoe and the accessory port, much like the flash on Sony's NEX cameras. Naturally you can also use more powerful system flashes with the E-M1 – such as the FL-36R, the FL-600R or the FL-50R – but these are of course sold separately. One novelty here is the inclusion of a Prontor-Compur flash sync terminal, which allows the use of mains flashes and other cable-contact flash units via a standard sync cable. Olympus specifies an x-sync speed of 1/320s with the FL-LM2 and 1/250s with other external units but our review sample was capable of fully syncing a third-party flash hooked up to the camera via a sync cable at 1/400th of a second. Even at 1/500s, the blacked-out part of the frame was so thin that when we used a cropped format – such as 16:9 – we were able to get a clean flash exposure across the entire frame. Do note that this might be down to sample variation, though. The Olympus E-M1 features the manufacturer's second-generation accessory port beneath the hotshoe, which allows users to attach a variety of optional peripherals such as a Bluetooth adapter, an external microphone adapter kit or the MAL-1 Macro Arm Lights. As noted above, it is also necessary for mounting the supplied FL-LM2 flash. (You could theoretically attach an external viewfinder too, but the only benefit would be that it can tilt upward, unlike the built-in one – but given that the rear screen is articulated, there's little point in investing in an external finder.) Note that all of these accessories occupy the hotshoe too, so if you wanted to connect, say, a flash and a Bluetooth adapter at the same time, you would need to connect the flash via the PC sync terminal. Focusing is one area where the Olympus OM-D E-M1 offers a clear improvement over the E-M5. For starters, the number of selectable AF points has been expanded to 81 versus the E-M5's 35. Low-light auto focus continues to be excellent – the system managed to focus down to -2EV (as long as there was something to focus on) even without the use of the focus assist lamp. This is seriously low light, about the same as a landscape lit only by moonlight and nothing else. The biggest news, however, is the inclusion of 37 on-sensor phase-detection auto focus points, which enables better continuous AF performance – especially with low-contrast subjects in low-contrast light – as well as fast focusing with “regular” Four Thirds lenses, mounted via an adapter. The continuous shooting speed has been increased too, to 6.5fps with auto focus (up from 4.2fps on the OM-D E-M5), and 10fps without. Manual focus enthusiasts will be delighted to learn that the Olympus E-M1 has a focus peaking feature, which enables precise focusing even without magnifying into the live view feed; although we would love to see a few more options for the outline colour. Cameras without wireless connectivity are increasingly at a disadvantage over competitors that offer this feature, so Olympus could not afford to launch a new flagship without Wi-Fi. The implementation on the OM-D E-M1 is actually quite good. You first need to download a free app for your smartphone (Android and iOS versions are both available), but after that, everything is pretty straightforward. You simply touch the Wi-Fi icon on your camera's display to set up a connection. The Olympus OM-D E-M1 will provide you with an SSID and password, but you do not need to type in either of them – just launch the app on your phone and scan the QR code displayed by your camera with your phone. This is nearly as fast as using NFC (Near-Field Communication), a feature that the OM-D E-M1 doesn't offer. Once the connection is established, you can download images from the camera to your smartphone, or use the latter to remotely control the E-M1. The level of control provided is quite good – you can choose from a variety of shooting modes, set aperture, sensitivity, shutter speed and white balance, choose a drive mode, and focus on practically any part of the frame, all remotely. The Olympus E-M1 has a time-lapse photography mode, which allows you to capture up to 999 frames at user-specified intervals. You can also tell the camera when to start the sequence, which comes in handy if you want to set up the camera well in advance. The E-M1 will save each shot in the format of your choice – ORF or JPEG – and can optionally create a time-lapse video in-camera, which you can play back on the rear screen, or upload to a website like Vimeo or YouTube. While shooting raw and creating a video afterwards on your PC gives you more control over grading, sharpening etc., the in-camera option is nice to have when shooting JPEG or raw+JPEG, as it is obviously much faster. 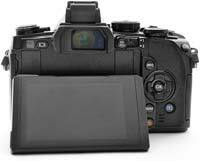 The menu system is similar to that of the E-M5, with a few new options for the new features. This is a complex, multi-level menu system that might not seem intuitive at first sight, so reading the manual is a good idea before starting to explore it. The good news is that these menus are mainly there to allow you to set up the camera exactly the way you want it to be set up – once you're done with that, you'll seldom need to delve into the menus again, courtesy of the large number of external controls as well as the excellent Super Control Panel, which is basically an interactive status display inherited from older Olympus cameras. The Olympus OM-D E-M1 is powered by a proprietary BLN-1 lithium-ion battery, which may sound like a bit of a let-down for those who have been hoping that it would use the more powerful BLM-5 unit developed for the Olympus E-5 DSLR. On a more positive note, the BLN-1 is the same battery pack that's used by the OM-D E-M5 so those who upgrade from the earlier model will be able to use their existing spare batteries with the E-M1 too. The camera saves images and movies on SD, SDHC and SDXC memory cards (up to UHS-I speed class). Unfortunately there's only one memory card slot, so it isn't possible to make instant back-ups in the field by saving your shots on two cards simultaneously. Wired connection ports include a combined USB-A/V terminal, a micro HDMI port and a standard 3.5mm stereo microphone jack. In use the Olympus OM-D E-M1 has turned out to be a very enjoyable camera. The slightly bigger size, contoured hand-grip and larger, easier-to-use controls make it vastly superior to the OM-D E-M5 in terms of ergonomics. We liked the E-M5 a lot, but the E-M1 is clearly a better choice for anyone with medium to large hands and/or long(ish) fingers, while still being smaller than most SLRs. The redesigned control layout is well thought-out and the level of customisability is extremely high. Setting the camera up the way you like it is not trivial, but there are precious few other cameras that can be better tailored to a photographer's individual preferences. Once you've set it up you can pretty much forget about delving into the complex and long-winded menu system again, which is excellent news to anyone who has an aversion to using menus when shooting out in the field. The camera is robust, extremely responsive and very fast to focus. Thanks to a combination of contrast- and phase-detect AF, its ability to keep a moving subject in focus is quite close to that of an SLR, which is no mean feat given that the OM-D E-M1 is a compact system camera after all. The E-M1's operational stability is fairly good, although it did lock up once during the review period, with the only solution being the removal and re-insertion of the battery. That glitch aside, the Olympus OM-D E-M1 has proved to be one of the most enjoyable compact system cameras we have ever tested.